I have been working on the first page of embroidery sampler book. 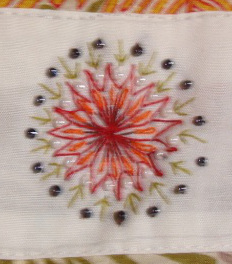 Today this flower was stitched with stem stitch in two shades of perle cotton # 8. These samples are really interesting. 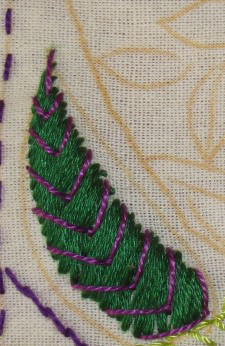 This part is some samples worked in satin stitch, straight stitch, running stitch and french knots. Another fly stitch variation was stitched in the corner. In the free style sample book, I am working on the first page. 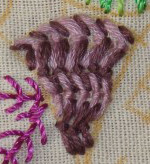 After working on some fly stitch ideas, a space in between the patterns was worked in buttonhole stitches. The half buttonhole wheels are worked in two threads. And angled buttonhole stitches are worked facing each other and the one of them is whipped with another thread. I am working on this fabric book, on which the pages comprise of free style embroidery and TAST challenge stitches. The first week’s stitch is Fly. In this sample, the fly stitch rows are worked in a semicircle with different colours and threads. 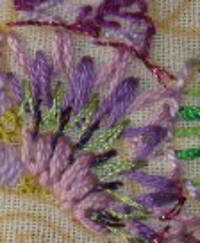 The fly stitches and stem stitches are worked to on a filling pattern. 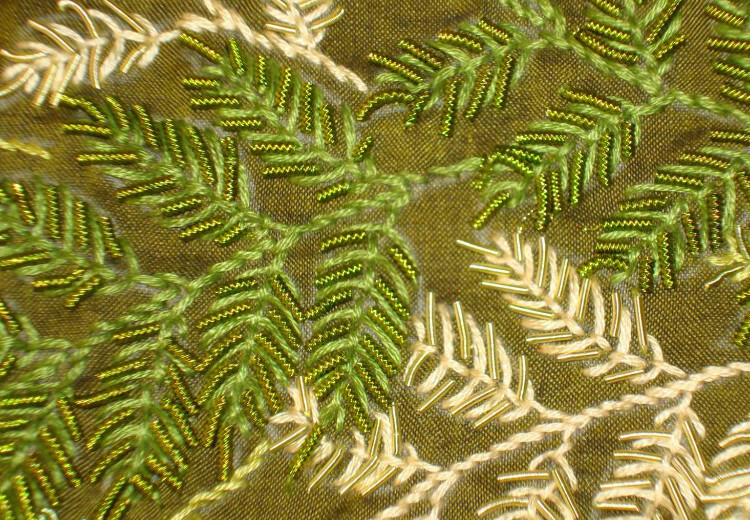 Fly stitches are worked over satin stitched leaf. This tiny sample is worked in fly stitch variation. 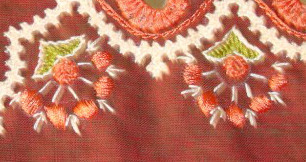 The two straight stitches are looped, similar to wheat ear stitch. They are worked in quarter circle. I am working on embroidery sampler book. These fabric pages will have free style embroidery and TAST 2015 stitches on them. The first page has fly stitch, the first stitch on TAST 2015 challenge. The working of which is on Sharon’s blog. 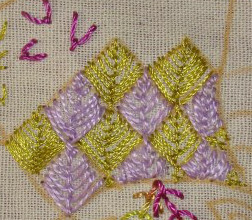 In this sample fly stitches are worked horizontally in two directions and two shades. Fly stitch rows worked in two shades drift down towards the centre. The idea of working a sampler book is slowly progressing. 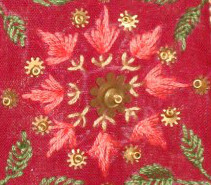 The basic idea is to work embroidery on 6inches by 6 inches square. 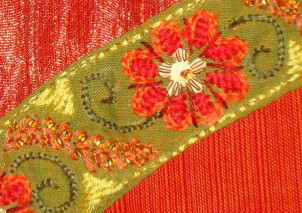 The stitches are a combination of TAST stitches and other embroidery stitch treatments. These other embroidery samples are inspired by the works seen on the internet and some of my ideas. All these notions are more in mind at this point. 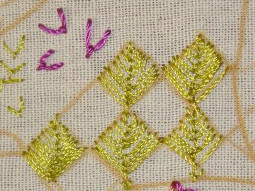 With the help of the online classes taken with Sharon, I am trying to build one embroidery page at a time. When the TAST rerun was announced, I thought of working this idea as a personal challenge. Page1- I have started this page with fly stitches. Continuous fly stitches worked in zigzag pattern. 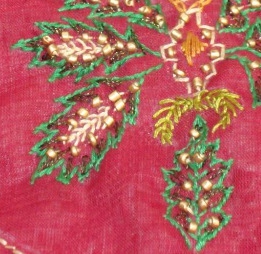 Fly stitch filling, worked in fine silk thread. The same filling work in perle cotton. 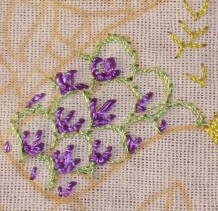 This filling idea is inspiration from needle point stitches. 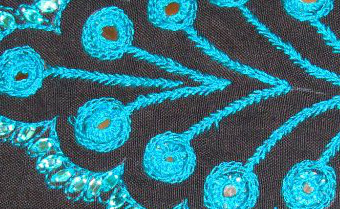 Fly stitches are worked around a circle and are whipped in the centre. The TAST challenge has surfaced at last this year. It is rerun of the 2012 challenge. Still I like the idea of weekly stitch challenge. This fly stitch was part of an earlier TAST challenge too, I worked some samples when it was rerun on stitchinfingers community in 2008. The details of the samples are posted here. I worked more samples in 2012. The details are posted here. The method of working the fly stitch is posted on Pintangle. For some time, an idea of working a sampler of various embroidery stitches was on my mind. After getting some input on this from Sharon and other members of TAST group on facebook, the first steps for this book has started. More details will be posted on its progress soon. 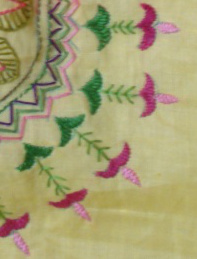 These are some samples of fly stitches used on various embroidery works. 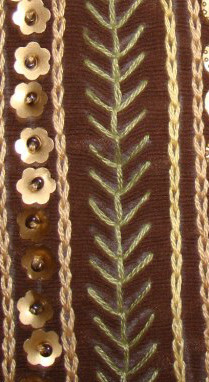 Here the fly stitch is worked as linear stitch along with sequins. 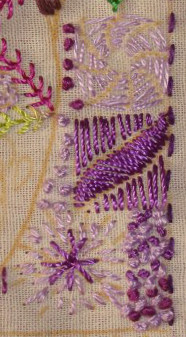 Fly stitch are worked on printed border. 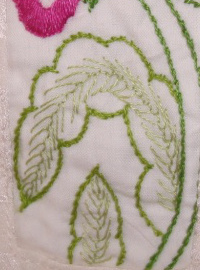 Fly stitch used on leaf design with stem stitch outline. A fly stitch combination. I have used this on many projects. Fly stitch worked in a circle with beads. 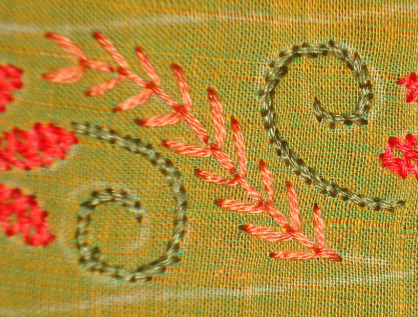 Fly stitches worked with Algerian eye stitch variation. Fly stitch part of this stitch arrangement. This fly stitch was worked to add beads in between the stitches. 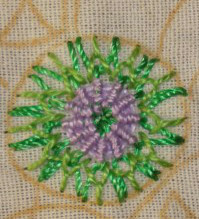 Another fly stitch leaf with beads and stem stitch outline. Individual fly stitches on design. Fly stitches with back stitch centre. Fly stitches with zardosi beads. Fly stitch arrangement with sequins. Fly stitch stems with mirrors and stones. 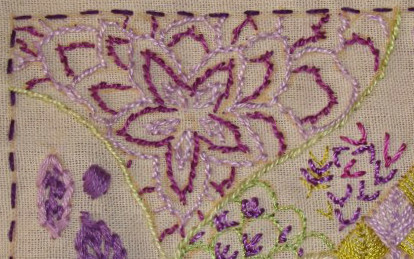 There has been extensive use of fly stitch on these embroidery projects proving that it is a great stitch on its own and also enhances other stitches.